I'd never heard of Norwegian Lefse until I ended up with a surplus of mashed potatoes after making some Gluten Free Potato Noodles and wow! These were so much better than I expected. I was searching around on the internet for recipes involving leftover mashed potatoes and came across this traditional Norwegian dish called lefse. Turns out these are really versatile potato/flour wraps that have a texture and thinness not unlike crepes. They're amazingly soft and flexible and are surprisingly tasty. 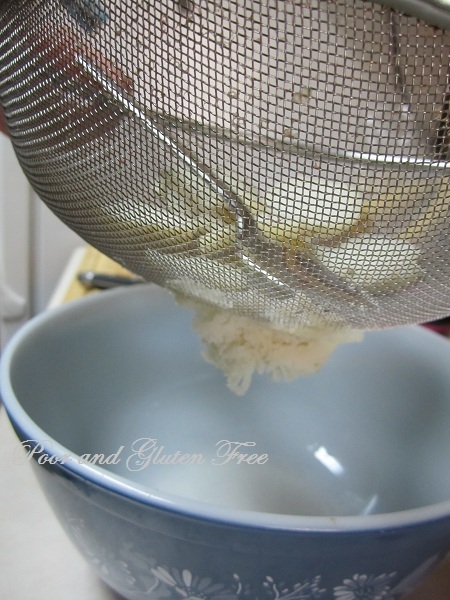 These are actually very simple and cheap to make, but rather time consuming so be prepared to spend a bit of time in the kitchen rolling and frying. Part of the tradition around making these, though, seems to be getting a group of ladies together and using those extra hands to help you make a huge batch of these and freeze them. I ate all mine pretty quickly and didn't have a chance to freeze them, but I expect they'll freeze fine with a layer of wax paper between them. Next time I'll probably double the recipe and freeze them. 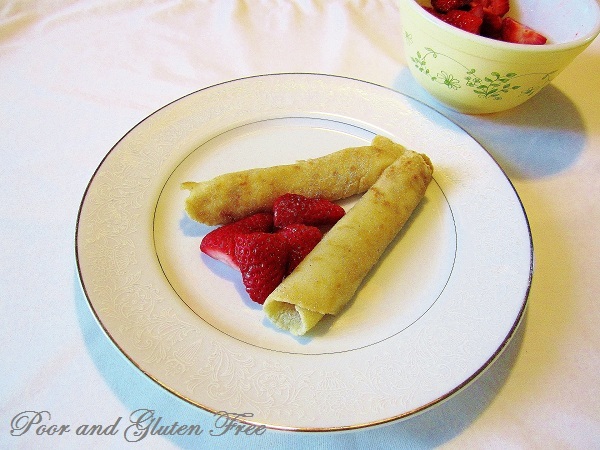 I sprinkled mine with equal parts sugar and cinnamon and rolled them up (this is a traditional way to serve them as a dessert) but you could use them for just about anything, like a sandwich wrap, or fresh fruit or sauteed veggies. Those of you allergic to white potatoes might want to try sweet potatoes instead (I haven't yet, but I will next time). 1. Mix the flours together and divide in half. 2. Mix all ingredients with one half of the flour together to form a smooth dough. 3. 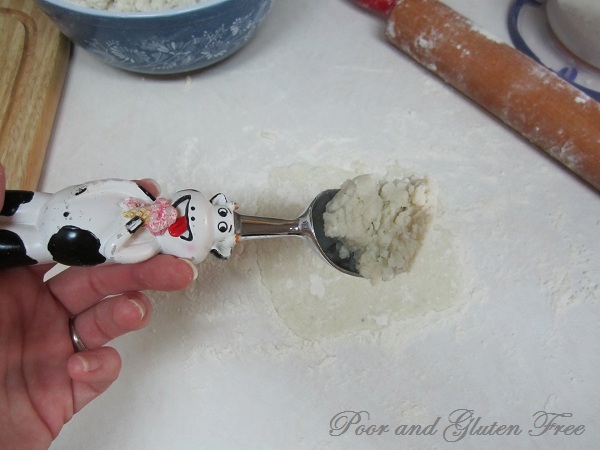 Sprinkle an ample amount of the flour on a flat surface. Scoop out a walnut size (or small ice cream scoop) of dough, sprinkle with more flour and roll out the dough very very thin with a rolling pin. 4. Heat a griddle or pan to medium high heat. Spray with oil or a thin layer of butter. Fry until browned (a couple of minutes) then flip and fry the other side. Remove from pan and lay on a paper towel. Note: I had a little system set up where I was able to cook one while I rolled another one out, just keep your flour on hand to keep sprinkling. I'm so ignorant of Norwegian food, so if any of you have ever had lefse or any other Norwegian dishes I'd love to hear about them!! Now I'm hungry. Those look really good! I am Norwegian and grew up on Lefse; a staple for any holiday. But it has always come with the idea that it is a torturous thing to make, or make right anyway. Yet, your article has given me the courage to try. Finally, I'll put to use all the Lefse making tools my husband has given me every Christmas. Our favorite way eat them is with Lingonberry Jam. But there is a restaurant in Wisconsin, The Norske Nook, that makes wraps out of them that I hear are very good. Unfortunately, I have never had them because they do not make them GF. Hi, thanks for the link, that's interesting! Lefse aren't difficult to make at all, they're just time consuming ;) Co-op some friends/kids/husband and put on some good music! Thanks so much for the tip!! I had no idea how thin they were supposed to be and I wasn't sure how fragile they'd end up so was afraid to go too thin. In the end, they weren't at all fragile, and very flexible, so they could definitely be rolled thinner. Lol, well if you're the only one eating them the grandmas need never know they're not perfect ;) Glad the post inspired you! 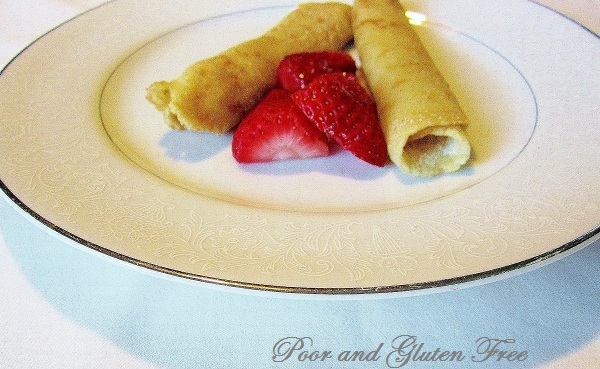 So far I have had trouble finding a lefse that works without gluten. I grew up on it, it's a holiday tradition in my very traditional Norwegian American family. I'll try this one too. Oh yes, love lefse and I haven't been able to find it yet this year. Simple with a little cinnamon sugar... I could go for some right now!